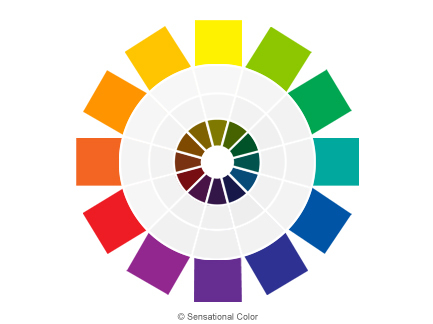 The color wheel is a tool for understanding color and color relationships. Think of it as your cheat sheet or “SparkNotes” for color. The most common color wheel and the one that I use is the twelve (12) hue wheel. A color wheel could have as few as six hues or as many as 24, 48, 96 or more. I think twelve is the perfect number when you remember that the wheel is a color relationship reference tool not a color selection tool. The color wheel will get you into the ball park by giving you ideas for a variety of ways to combine colors and create color harmonies. When you get ready to select actual colors for a project, you will use a fanguide, chip rack or online tool that shows you hundreds or maybe even thousands of colors. 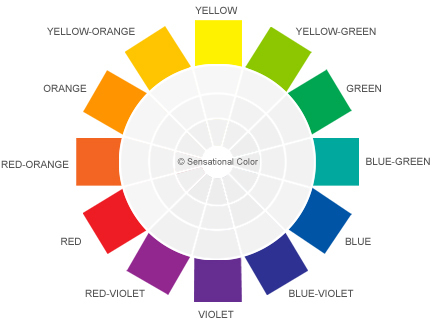 The quickest way to become familiar with the color wheel is to look at each of its parts. Hue: A hue is the purest or brightest form of a color. 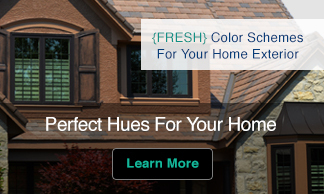 Hues are colors that have not been mixed with white, gray, or black. The twelve colors around on the outermost part of the wheel are hues. Tint: The circle of colors next to the hues represent the tint of each hue. A tint is the hue mixed with white. The hue may be mixed with just a touch of white or with so much white that the hue is very faint. All are considered a tint of the hue. On the color wheel only one tint is shown. This is the hue mixed with 50% white. 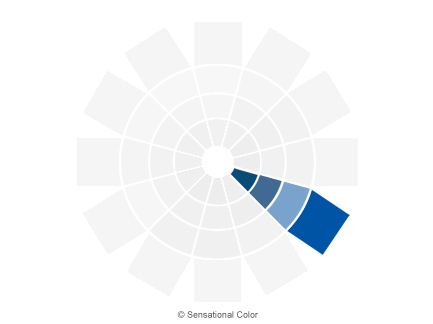 Tone: The next circle of colors represent the tone of each hue. A tone is the hue mixed with true gray. The hue mixed with any amount of gray is considered a tone of the hue. On the color wheel only one tone is shown. This is the hue mixed with 50% gray. Shade: The inner most circle of colors represent the shade of each hue. A shade is the hue mixed with black. Just as with the tines, the hue may be mixed with just a touch of black or with so much black that you are hardly able to detect the hue. All are considered a shade of the hue. On the color wheel only one shade is shown. This is the hue mixed with 50% black. 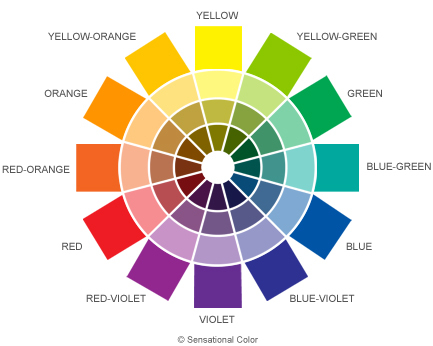 Each of the twelve (12) hues on the color wheel plus all of the many tints, tones, and shades that are made with each hue make up the colors you see on the color wheel. Color Family: Each segment on the color wheel represents the color family of that particular hue. The segment shown above is the blue color family. Now that you know the different parts of the color wheel and are able to define each, we will begin looking at how the colors related to one another on the next page titled: Color Relationships: Primary, Secondary, Tertiary Hues. Thanks for your nice comment. 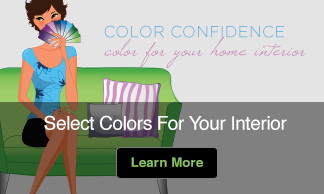 I’m glad you found the color information helpful. I would request you to advise me the hex codes for green hue, tint, tone and shade…It will be very helpful. Thank you very much for this excellent and easy way of explain things. I am a photographer, I stumbled upon this page today. I thought of going through other pages and write a comment, but I have decided to write a comment first and go to other pages later, because I can make out that I have stumbled upon a treasure trove of knowledge. Hi! I’ve been reading your website for some time now and finally got the bravery to go ahead and give you a shout out from Austin Tx! I also am so happy to find your Web Site, I’m a Want-To-Be knitter. I’m at a place now of moving into a place where I must make color choices with yarn to put projects together. So it’s very nice to learn the process of making color choices?? Thanks, I’m glad you found my site, too. I have worked with knitters in the past and when adding an accent color it is so important to understand how surrounding colors influence one another.